I have lived out in the country most of my life. I love being in nature and outdoors. Throughout my life I’ve been able hike and backpack in a few different mountain ranges. At my current stage of life and where we live, a walk around the pond on our property or a short hike at the local state park still lets me enjoy nature frequently. Several weeks ago, my husband and I were out for a walk at night. The air was so fresh and clean and prompted me to take big refreshing breaths filling my lungs to capacity and releasing it all. We stopped, looking up at the stars. They were so bright and gorgeous and twinkling. The sky was full of them. And we noticed a big, bright orange one that I had never noticed before. A quick check on a phone app quickly told us it was Mars. We stood there and marveled at it, then went and got the boys out of bed so they could see Mars too. They laid down in the driveway and we soon discovered we were in the midst of a meteor shower and shooting stars were regularly darting across the sky. I laid down on the driveway with them and marveled at it all. 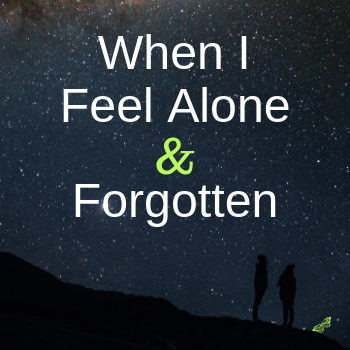 That brings me back to Isaiah 40:26, “Who created all the stars?...He brings them out…one after another, calling each by its name…not a single one is missing.” When I feel alone and forgotten, I find that it’s important for me to reflect on verses like this one. Verses that remind me who God is, “Because of his great power and incomparable strength, not a single one is missing.” I may feel alone and forgotten. But that’s not true. This God is MY God. I’m his beloved child. He created all of these stars and planets and meteors. He knows each and every star by name and brings each one out every night. How much more does he know MY name? He even knows the number of hairs on my head. He sees and knows my joy and my pain. If you doubt it, check out verse 27. And then there’s the end of verse 28, “No one can measure the depths of his understanding.” Not only does he see and know, he understands fully, completely, beyond measure. And, if he is your God, the same is true for you. You’re not alone or forgotten or overlooked. He sees you. He knows your joy and pain and he understands.